Environmental conditions this growing season have been conducive for several pathogens in flue-cured tobacco. Frogeye leaf spot (Cercospora nicotianae) has been particularly severe this growing season, affecting ripe and green leaves on all portions of plants. These leaf spots are characterized by a darkened margin with a white middle. Sometimes these lesions will have black specks in the center, which are spores that continue the disease cycle. Normally, this disease is of minimal consequence to North Carolina tobacco, but it has caused significant damage to unripened tobacco leaves. 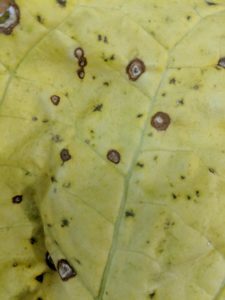 After reports of frogeye leaf spot control failures in flue-cured tobacco fields, samples of leaf spot lesions were tested for strobilurin fungicide resistance. These lesions tested positive for strobilurin resistance in the lab. Conditions for this disease may continue to be favorable, and conventional fungicides labeled for flue-cured tobacco (azoxystrobin) will not be effective for managing frogeye leaf spot. Several biological pesticides are labeled for managing leaf spots in tobacco, but information for their efficacy on frogeye leaf spot in flue-cured tobacco is limited or not available. Destroying crop debris quickly at the end of the growing season will help to reduce this disease for future crops. We are currently assessing other chemistries, especially biological, to assess their utility for Frogeye Leaf Spot, Target Spot, and Brown Spot control in tobacco. PRC and Organic tobacco have been produced for a number of years, and these chemistries are new to the market. As soon as data from North Carolina is completed, an update will be made available. Expect more details on the portal and at winter production meetings. If you’d like to discuss options for PRC and Organic tobacco foliar disease management, please contact your local extension agent or the tobacco pathologist.